Construction of new single-family houses fell 2.5 percent in April 2017 from the prior month, according to the most recent data made available by the U.S. Department of Housing and Urban Development. 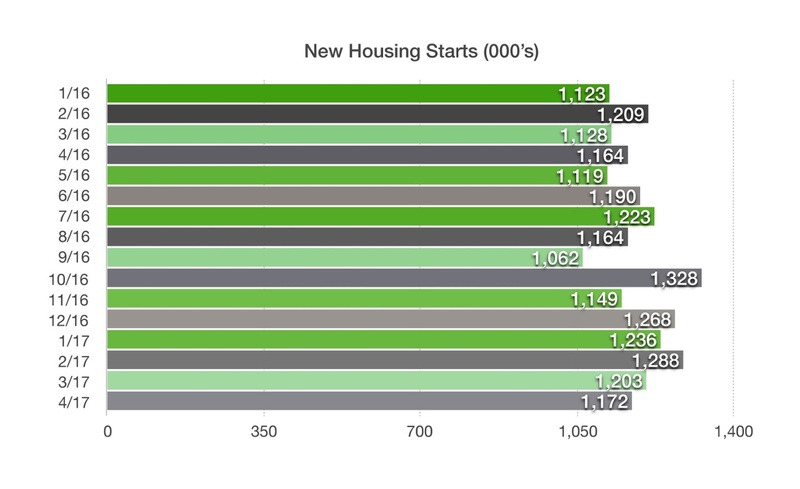 The annual rate of 1,172,000 housing starts only increased by 0.7 percent over the past year, validating a dismal growth rate of new homes being constructed. Fewer homes being built along with a slowly improving jobs market and growing families has helped escalate the demand for homes across the nation. As demand has been outstripping supply, home prices have been climbing across the country. In addition, construction of new homes has been despondent as a lack of qualified workers has hindered the home building industry since the displacement of jobs during the real estate downturn following 2007. The challenge of hiring stems from skilled workers that left the industry during the downturn and have found other occupations since then. Nearly half of mortgage borrowers in the first quarter of 2017 opted for a cash out option when refinancing. The amount of cash outs is at the highest since the 4th quarter of 2008, when the financial crisis was in motion. Cash outs were tremendously popular during the housing boom when almost 90% of all refinancing included a cash out option. Cash outs as a percentage of total refis dropped considerably to 12% in 2012 following new rules and regulations. Also fueling recent cash outs is the rise in housing values that allows homeowners to extract a portion of their equity as cash. Before new regulations, cash outs were available on higher percentages of home values, whereas rules today limit cash outs to much lower loan to value loans.